Hawk is The Great Leftovers Knight. And at the party when Ban first joined, Hawk rams Ban and said "respect the The Great Leftover Knight". And Ban said (I think) "I'm sorry for not recognizing you, master". It's like when you're good at something, and I admire you and call you master. It's like calling some idiot "sensei" or adding "-sama" sarcastically. But then it turns into more of an affectionate nickname than an insult, I suppose. BOI.... Ban calls hawk master because hawk is the captain of the order of scraps disposal, and Ban wishes to learn from him or in this case his "Master". Ban loves food as evidenced by his cooking skills. Ban had never met anyone who enjoyed food as well as Hawk. Ban respects Hawk for this reason. 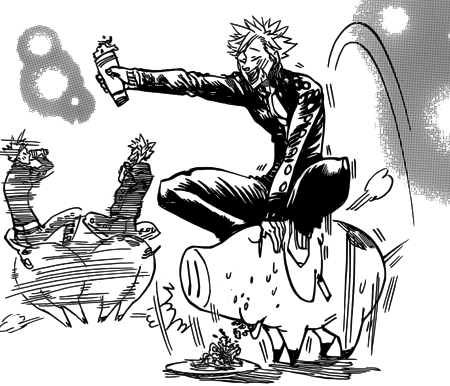 I believe that the reason Ban calls Hawk "master" is because none of the sins remember all the way back, and Hawk might have been a human who had been turned into a pig which explaining the talking pig part. And the "Master" part when Hawk was human, he was Ban's master which taught him so much about life and not to give up. I always thought it was implied ban joined the order of scraps disposal corp after being impressed with hawks title as captain of such a prestigious order. I dont think hes making fun of him.